First Encountered: 3.7 "It was in the Bleak December"
Description: An ancient underground ruin found next to lake Victoria in Ethiopia, where the Nile has its ultimate source. 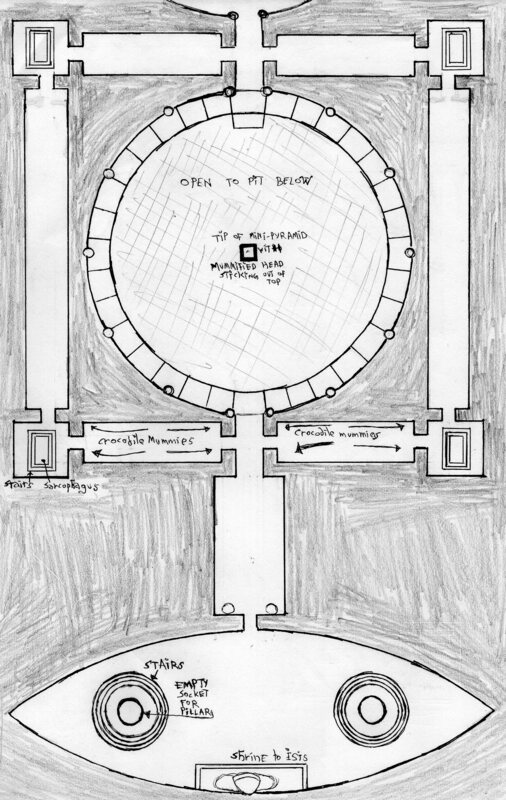 Both the Archaeomancers' research and on-the-fly translations by the PC's indicated that this isn't technically the original temple spoken of in legend, but a hidden refuge created by fleeing devotees. 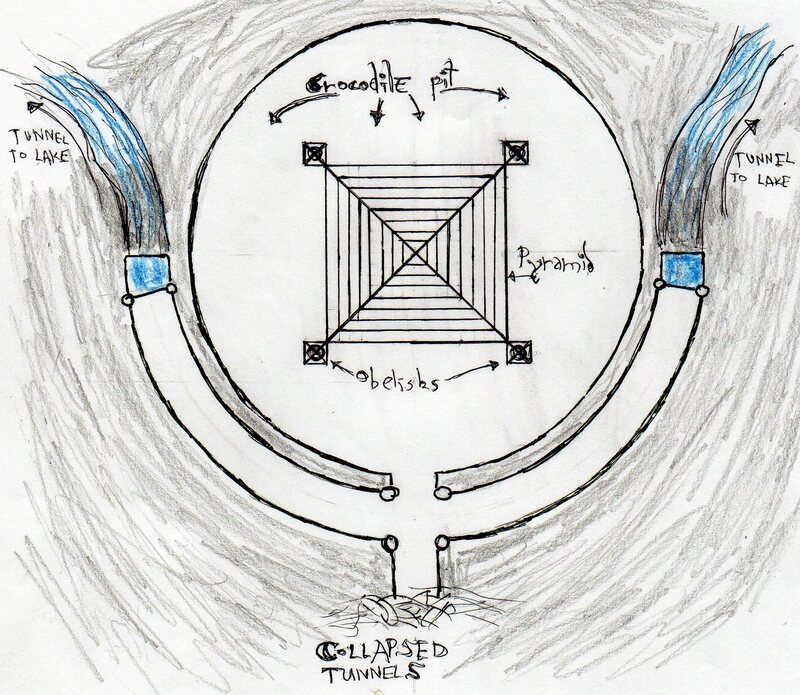 For uncertain reasons they saw a pressing need to evacuate the Pillars of Enoch from their ancient resting place in Zau, probably to save them from the Seer-equivalents of the time, and so they moved them here for a time. 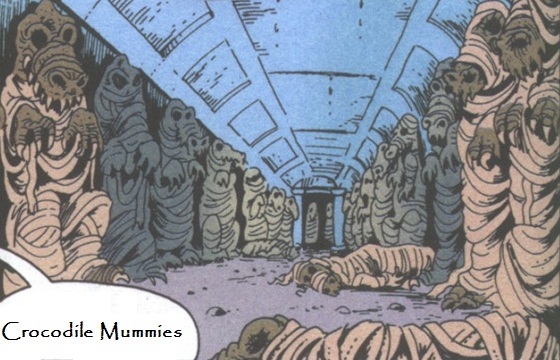 When the Archaeomancers and Tezcatlipoca rediscovered it, however, both the priesthood and the pillars were gone without any indication of what had happened to either of them. Contained the mummified yet still conscious remains of Uritu Yupanqui. All researchers in dynastic Egypt, Awakened and otherwise, who sought knowledge of Atlantis (wherever they wished to place its ruins), petitioned for access to the Temple of Sebek in Saïs. Here stood two columns carved with hieroglyphics already hoary with age when the Sphinx was newly sculpted. According to occult rumor then and since, those were the Pillars of Enoch, engraved with the knowledge of “all true arts and sciences” by the seventh patriarch after Adam. Enoch (or Enmeduranki, as the Sumerian records name him) learned magic from the Grigori, the Watchers in the Seventh Heaven. He returned and carved these insights into a pillar of brass and a pillar of stone, strong enough to withstand another cataclysm of flood or fire. The story of his journey, but only hints of his recovered magical lore, made it into the apocryphal Books of Enoch, condemned by St. Augustine among other Christian church fathers. The existence of the Pillars of Enoch, or at least of two pillars in the temple precincts at Saïs bearing knowledge of Atlantis, is confirmed by many ancient sources, both Sleeping and Awakened, as late as the visit of Krantor of Cilicia around 280 BC. The eventual Roman overlords of Egypt may have become jealous of the crocodile priests’ relics, or the Pillars may have vanished during one of the myriad invasions of Egypt since. 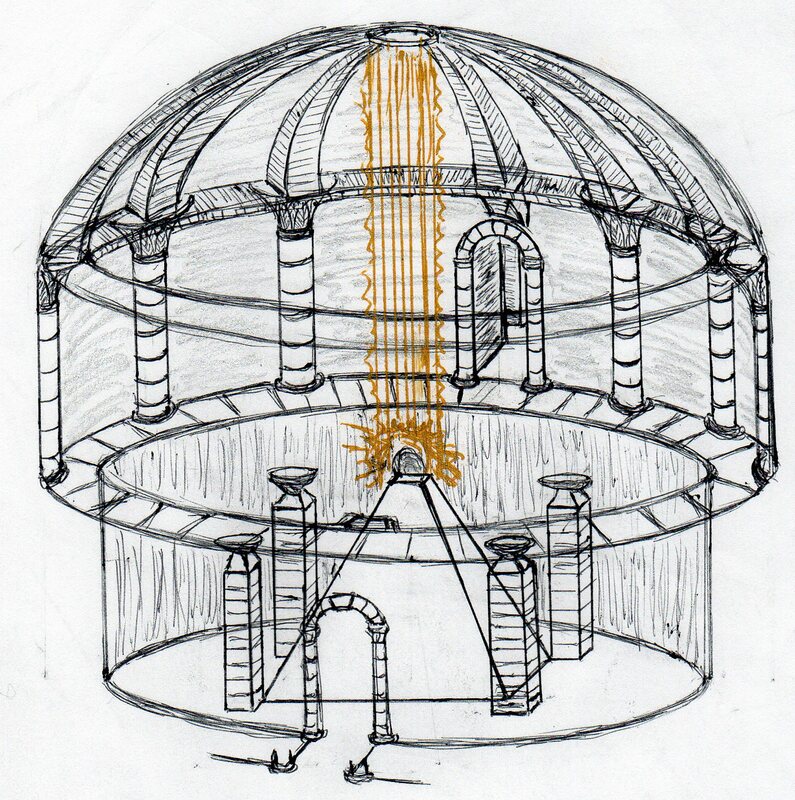 The Exarchs (or Oracles) may have stepped in, removing such dangerous truths from the increasingly numerous eyes of mortals and ambitious willworkers alike and secreting the Pillars in some other lost corner of the Earth. Four generations earlier one of the many scholars who sought them out was Emmeduranki, great grandfather of Utnapishtim and seventh patriarch after Adaman ha-Kadmoni, and what Emmeduranki took away from his visit he carved into a temple of his own. Though he could not recall the whole of the Watchers' lore he still managed to fill two pillars. In this fashion was the intent of the Devas denied, and before they could learn of its existence and remove the temple from Saïs several empires and civilizations had already sought it out and learned from its teachings, each making their own copies of what they remembered after departing. When that city was built did they claim Neith as patron deity, who was known as the origin of the Sons and their Enlightenment, and so was there also to Neith a shrine dedicated in that temple of Sebek wherein the remains of those teachings rested. An inscription there was to read on that shrine, saying "I am all that hath been, and is, and shall be, and my veil no mortal has hitherto raised." So potent were those secrets held there that through them was made possible the great undertaking whereat the innumerable races of man in that region sought to construct a celestial dwelling of their own, at Babel. All of the treasures and wonders they ever had did they employ towards this end, whether of their own making or exotic imports, but it would have been all to no avail had they not the design of old found in those hallowed halls. Yet that place was not to be, and like all cities before and after it came to an end. But the secrets locked withing those stones and edifices were dangerous indeed, and in their undoing was released powers so great that all towns and habitations bordering that wide ocean, yea, across that entire part of the world, were lain low and stood no more, no stone left on stone. All except Zau, protected against this second Deluge as it had survived the first, and as civilizations once more grew forth it was well known as the sole place that remained intact from that previous era. When the Greeks, like their ancestors before them, much later came to know Zau they understood Neith as their own goddess Athena, and soon began to believe that Athena too presided over learning, crafting, war, tactics, weaving creating and certain waters. So much were they taken with her that they made a grand city bear her name, which grew into a home where those who sought for truth could flourish and the Love of Wisdom could be embraced freely at last.